Kouign amann is one of my favorite pastries. Like a croissant folded into and hugging itself, a kouign amann (the Breton words translate to “butter cake”) contains layers of dough, butter, and sugar that bake into caramelized crispiness. They can be challenging to find even in the largest of U.S. cities, and the rare bakeries making them mostly do so in a single serving. Stepping outside the States to the city of Montreal, I was excited to try them in the traditional, large cake form that you’ll find them in the Bretagne area of France. 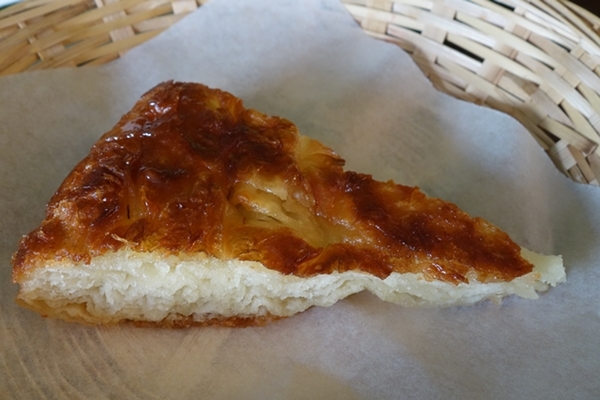 The first place to try is aptly named Patisserie Kouign Amann. In this bakery in the Plateau neighborhood of Montreal, yellow light bounces off the well-worn wooden floorboards and the open kitchen exudes sweet smells. All around, golden-colored croissants, danishes, and other pastries shine brightly, but the main event is definitely the large, pizza pie-sized rounds of kouign amann. Feast your eyes on a deeply golden crust, then order a wedge (CN$1.95, pictured atop post, with whole “pie” just above) and bite into the crepe-like layers of dough. This kouign amann is lighter in weight and has less carmelization inside than the rounds I’ve had at home. But despite being less crunchy, it has a nice level of sweetness accentuated by a light sprinkling of salt. From this modest but mighty bakery, I made my way to a much more elegant setting: Restaurant La Porte. Some say that this upscale, family-run French restaurant serves the best kouign amann in the city. 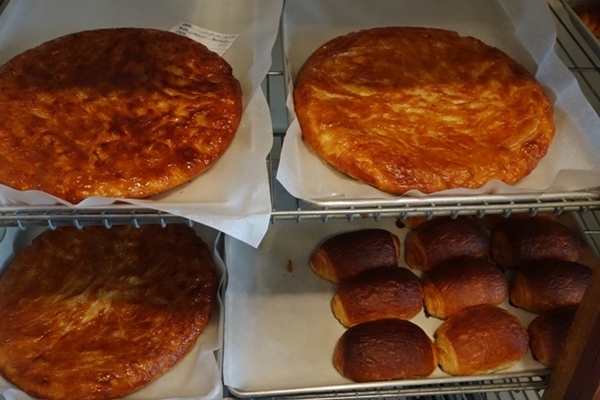 In fact, their kouign amann is so popular that La Porte sells whole pans of it at a local farmers market. Though if you go, expect long lines and know they sell out quickly. 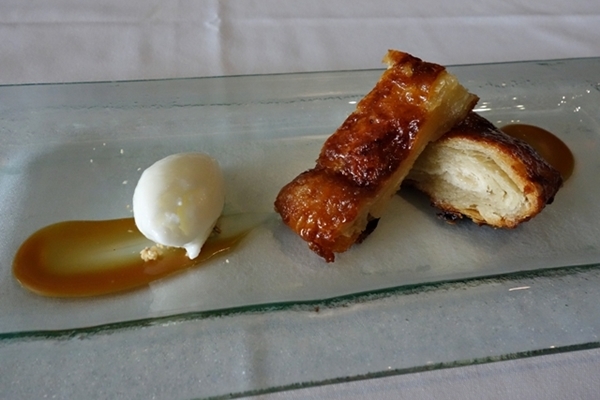 The kouign amann on their dessert menu (CN$10) is served with “caramel salt butter” and buttermilk sherbet. Formally plated, two rectangular slices of the pastry sit atop a swoosh of salted caramel sauce on one end of a long glass plate, and a quenelle of the sherbet sits atop more of the sauce at the other end. This kouign amann has crunchy texture as it’s flipped in a pan to caramelize both sides. I was told that salted butter is the secret to the success, and you can really taste it in all of the layers. The cool sherbet played off the still-warm kouign amann perfectly, with the caramel adding depth with its salty sweetness. Indeed, this may well be the best kouign amann I’ve ever had.